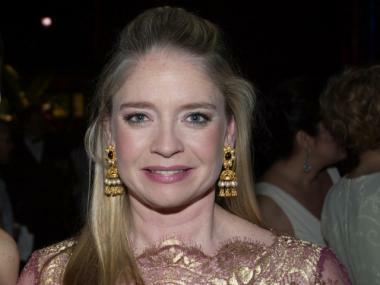 Marion Hedges, seen here at the New York Junior League's 55th Annual Winter Ball on March 2, 2007. HARLEM— Two 12-year-old boys have been charged with felony assault for tossing a shopping cart off an upper level of the East River Plaza mall, hitting and critically injuring a 47-year-old real estate executive who also sits on the board of some of the city's most elite clubs and charities. Marion Hedges, a real estate broker from Prudential Douglas Elliman who lives on the Upper West Side, was standing in the parking lot near the entrance to Costco with her young son about 5:48 p.m. Sunday when the shopping cart fell onto her, witnesses said. The cart came from the Target level of the mall a few stories above, witnesses said. Hedges, who graduated from Spence School on the Upper East Side and Barnard College, sustained a serious head injury, according to the FDNY. She also suffered a cardiac arrest at the scene, police sources said. She is listed in critical condition at Harlem Hospital, hospital officials said. A Target shopping cart at the East River Plaza mall is surrounded with yellow tape. A 47-year-old woman was struck with a shopping cart tossed from the upper levels on Sunday, Oct. 30, 2011. 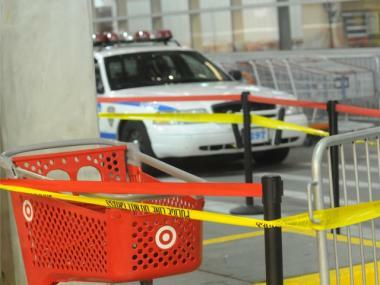 A red Target shopping cart was surrounded by yellow police tape Sunday. Police say the two boys, whose names were not released, have each been charged as juveniles with felony assault and criminal possession of a weapon. Police sources said the two boys were with another boy when they passed the cart, and the third boy urged them not to push the cart over the edge. They knew there people in the parking lot below, but the boys wanted to watch the cart smash into pieces, police sources said. When the cart hit the ground, the boys scattered. Police picked up the boys later that evening at their homes in public housing near the East River mall, sources said. They face a maximum of 18 months, if convicted, regardless of the severity of the victim's injuries, sources said. Witness Susan Mahoney said she and her husband, Gaurav Patel, a psychiatry resident at Columbia Presbyterian Hospital, were exiting the elevator after coming from the Target and heading to Costco when they came upon the scene. "We heard screaming as soon as the elevator came to a stop. We saw a woman face down with blood coming from the top, side of her head," said Patel. "People around said something had been thrown but I was thinking it was a bottle, not a shopping cart," he added. Patel got down on the ground and checked for pulses at Hedges' wrist and her neck. "She was not responding. She had no pulse at her wrist or her neck," said Patel. "She was turning blue. She was not breathing." Patel said he rolled Hedges over and began chest compressions for a minute. "Her heart started back up and she started breathing irregularly," he said. A Costco employee had already begun clearing the area, comforting Hedges' young son, and corralling witnesses for the police to speak to, Mahoney said. Mahoney walked Hedges' son away from the scene and tried to comfort him by explaining that her husband was a doctor and that he was trying to help her mother. After doing CPR for a few minutes, Mahoney said her husband noticed that Hedges began breathing. She also moved some of her limbs in the ambulance. Mahoney said the Costco employee complained that she had called Target security shortly before the incident to complain about kids dropping things from the upper level. "She was really upset because 30 minutes before it happened she called Target security and told them they were throwing Slurpees down on the customers. Target security told her they did not handle anything outside of their door," said Mahoney. Gary Lewi, a spokesperson for East River plaza and Blumenfeld Development, which owns the development, said it was too early to comment about the incident. "We are waiting for the police report to tell us what happened. This is a criminal matter with family court," Lewi said. According to Hedges' bio, she is involved in several nonprofit organizations, including the Stanley Isaacs Community Center on the Upper East Side, where she is an executive board member, her bio says. She was named to the Prudential Douglas Elliman's Leading Edge Society. Company CEO and president Dottie Herman issued a statement Monday saying: "Our thoughts and prayers are with Marion and her family as we wish her a full and speedy recovery." She is also involved in the Junior League, where she earned the 2006 "Outstanding Volunteer" award for her volunteer work in NYC. "It's such a terrible thing, I'm shocked," said Wanda Wooten, executive director of the Stanley M. Isaacs Neighborhood Center. Wooten said she saw Hedges with her daughter on Friday at a fundraiser. "She is very generous and caring and active. She is a great community person and does so many things," Wooten added. Of the fact that the alleged attackers were pre-teens, Wooten said, "They're babies. I don't know what to make of it ... It's just horrible." Wooten said the board has been trying to gather together to help Hedges' family, and added, "They're going to need a lot of moral support, at the very least." Amy Zimmer and Sonja Sharp contributed reporting.